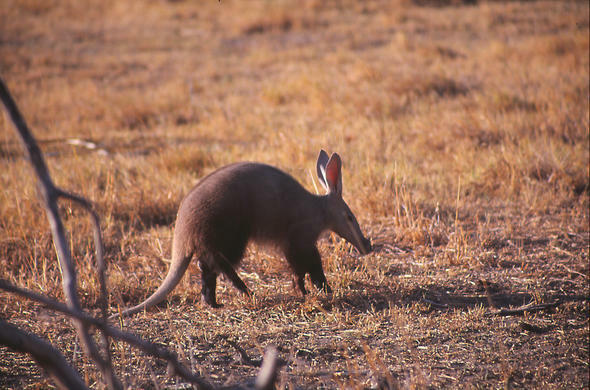 Aardvarks prefer areas of grassland and sparse scrub and are found throughout Botswana although the numbers are dictated by the food source. They are more common in areas with a high occurrence of termites and ants. You are most likely to see Aardvark on night game drives and during the rainy season from December to March. Aardvark - meaning 'earth pig' in Afrikaans is generally considered to be nocturnal although it is sometime seen foraging in the daytime. It is a rarely seen species by visitors to Africa and is high on the list of 'wannasees'. Aardvark dig elaborate burrows with as many as ten chambers. These burrows are used by other species such as warthogs, porcupines, owls and even bats. Humans pose the greatest danger to aardvark and they are also preyed upon by lions, hyenas and leopards. When in danger they will head down the nearest hole although they are known to use their powerful claws to protect themselves. Aardvark feed on termites and ants which they dig out of their nests with their powerful claws. They may walk more than five kilometers a night foraging, their nose close to the ground, and when they locate a food source they will dig quickly before probing the colony with their long sticky tongues. Although very unusual, they have been observed eating other small insects and even fruit. Very little is known of the breeding behaviour. A single young is born after a gestation period of approximately 200 days.